Thanks to chassis unique 3D drawings, the chassis and bodywork for several Volvo Trucks' truck models can now be designed in parallel. This means that the bodybuilding process - and thus the customer lead time in some cases – can be shortened by up to 14 days, whilst maintaining the high quality. "We know that it is critical for our customers that the delivery does not drag on, as their own transport tasks can stand or fall according to the access they have to this particular truck. Therefore it feels especially good to contribute to the efficiency of this process," says Peter Hardin, Product Manager, Volvo FM and Volvo FMX. The more complex the bodywork is, the longer the lead-time often is before the customer has access to the truck. One way to speed up the process is by building the bodywork in parallel to the production of the truck. Yet in order to determine the exact height and space needed for certain components and thus get the application to match the chassis, the bodybuilder needs access to detailed information on chassis dimensions. With this in mind, Volvo Trucks has now developed advanced three-dimensional (3D) drawings, which are now available for bodybuilders via an internet-based database. "The major advantage of 3D drawings is that they allow for a parallel workflow in which the chassis and the bodywork can be produced simultaneously, instead of consecutively. Put simply, the bodybuilder doesn't need to wait for the truck to be finished to find out crucial information about the chassis," says Tor Hesselgren, Body Builder Development at Volvo Trucks. The availability of chassis unique 3D material allows the bodybuilder to see exactly how the finished chassis will look before it is constructed, as everything - from the rear axle position to the height of the propeller shaft and wiring - is included in the drawings. It is possible to do everything from zooming in on specific details, to spinning the truck model around and looking at it from above, from below and from the side. The detailed advance information allows the lead-time for the customer to be shortened, while at the same time maintaining high quality. 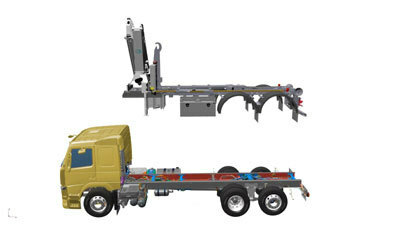 In total, the bodybuilders' access to 3D drawings, together with Volvo Trucks' new and more flexible chassis platform (which means that the chassis to a greater extent can be prepared for bodybuilding during assembly at the Volvo Trucks factory), means that the customer lead time can be shortened by 7-14 days.